Mendes achieves the impossible as audiences find themselves learning to love the Lehmans. Fact: when Lehman Brothers Holdings Inc. filed for Chapter 11 bankruptcy on September 15, 2008, it was the fourth-largest investment bank in the United States. A disaster for more than just its clients, Lehman’s criminally negligent involvement in the speculative subprime mortgage market pitched a whole raft of equally culpable financial institutions over the edge, precipitating the greatest global financial crisis since the Stock Market crash of 1929. While arguably equally culpable firms like Goldman Sachs, Morgan Stanley and Merrill Lynch saw it through with the help of world governments, Lehman Brothers was thrown to the wolves, its name living on in infamy (and that despite the fact that family members hadn’t run the company since 1969!) All of which is why a play that makes you a) understand the GFC and b) actually care about the family behind the tainted brand is a bit of a minor miracle. 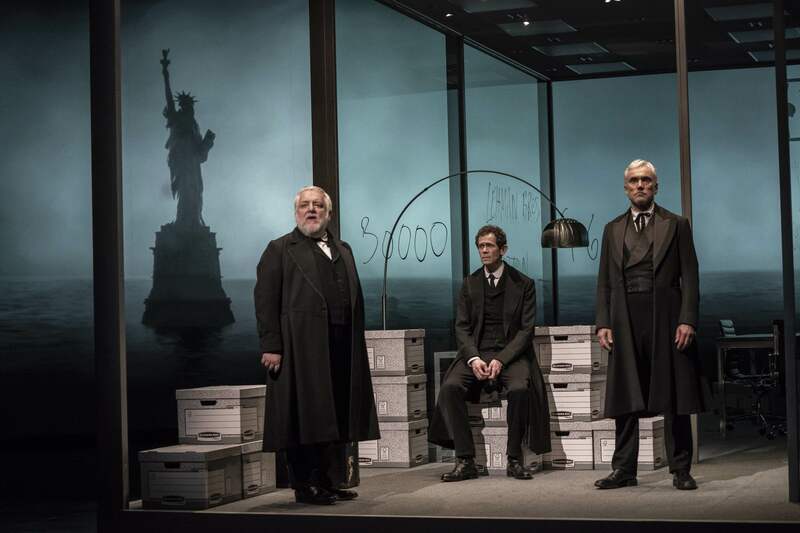 But The Lehman Trilogy, Sam Mendes thrillingly ambitious, virtuosic staging of Stephano Massini’s 2013 play now playing at New York’s Park Avenue Armory, is far more than a fiscal history lesson. With themes ranging from immigration to US pre- and post-bellum politics, as well as the American Jewish experience, public business versus private religious practice, fathers and sons, and the dangers and heady thrill of unregulated capitalism, it’s one of the richest, most informative and ultimately thought-provoking plays of the decade. 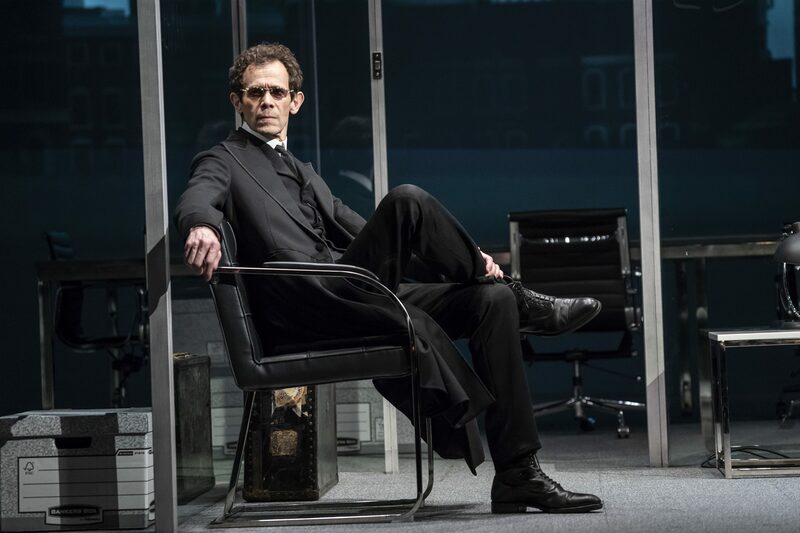 As a play about “The American Dream,” it ranks alongside the finest works of Eugene O’Neill (with whom it shares a scale), Arthur Miller (with whom it shares an intimacy of detail) and even, in its sublimely fantastical elements, Tony Kushner. Divided into roughly one-hour parts, the Trilogy begins with Part I: Three Brothers, as Hayum Lehmann (reinventing himself as Henry Lehman) arrives in New York from Rimpar, Bavaria and settles in Montgomery, Alabama where he proceeds to open a general store. Henry (the smart one: “the head,” they call him), is soon followed by brothers Mendel (Emanuel, a hothead, called “the arm”) and Mayer (a natural mediator, known as “the potato”). Expanding into cotton, the brothers take advantage of a natural disaster to become the first of their industry’s “middlemen,” even – echoes of the subprime crisis – buying up cotton that hasn’t been grown yet. Henry dies unexpectedly, but Emanuel and Mayer thrive, opening an office in New York and relocating north once the Civil War makes it clear that the South is economically down and out. Blessed with gold-star performances by Simon Russell Beale as the ever-confidant Henry, Ben Miles as the single-minded Emanuel and Adam Godley as the charming Mayer, it’s a race through early family history and perhaps a little less gripping than what is to come, but it’s never less than involving thanks to Mendes’ pacy direction and his cast of the UK’s very finest. Part II: Fathers & Sons, charts the rise of Emanuel’s son Philip Lehman (Beale again, quite brilliant as the bespectacled micro-manager). Helping found the New York Cotton and Coffee Exchanges, investing in railways and the Panama Canal, Philip soon pushes his father and uncle into comfortable retirement and side-lines his cousin Herbert (an indefatigable Miles again), who goes on to become Governor of New York. Having steered the ship into increasingly lucrative ports, Philip eventually hands the firm over to his son Bobbie (Godley, highly convincing as the louche horse fancier and art collector, who became the Met Museum’s first board chairman). Using the metaphor of tightrope walker, who finally falls after 50 years traversing the skies of New York, Philip finally loses his nerve on the eve of the Wall Street Crash. The final instalment, Part III: The Immortal, shows an increasingly fanatical Bobbie rebuilding the firm post 1929 through shrewd investments in movies (King Kong and Gone with the Wind being two notables), airlines and cigarettes. By encouraging the shift from people spending money to live, to people living to spend money – in other words, by building a “consumerist society,” – Bobbie believes bankers will live forever. It is he who, shortly before his time runs out, starts a trading division within Lehman Brothers, setting in motion the whirlwind events that will lead a part of the company down the road to speculative risk and final downfall. Ben Power’s adaptation, from Massimo’s original Italian text is a glorious mix of epic history and page-turner novella with a dash of Homer, spinning from casual conversation to third-person narrative on a proverbial dime. Laced with insight, wit and humanity, it gets under the skin of these frequently driven men, first, second or third generation immigrants all. Along the way, we learn a great deal about Judaism and how America – as far as Jews were concerned, the only non-pejorative 19th-century society in the world – helped shape an individual brand of Jewish liberalism. We also see how that, plus a dose of unscrupulous business ethics, erodes the family’s adherence to ritual observances. Where the brothers shut up shop and sit shiva for a week following Henry’s premature death from yellow fever, Emanuel gets three days and Philip’s passing sees the business close its doors for a mere three minutes. The three actors are kept busy portraying not just the Lehman clan, but their wives, friends and business associates. A mark of the production’s brilliance is how little it seems to matter that the actors sport the same black, 19th-century frock coats throughout. 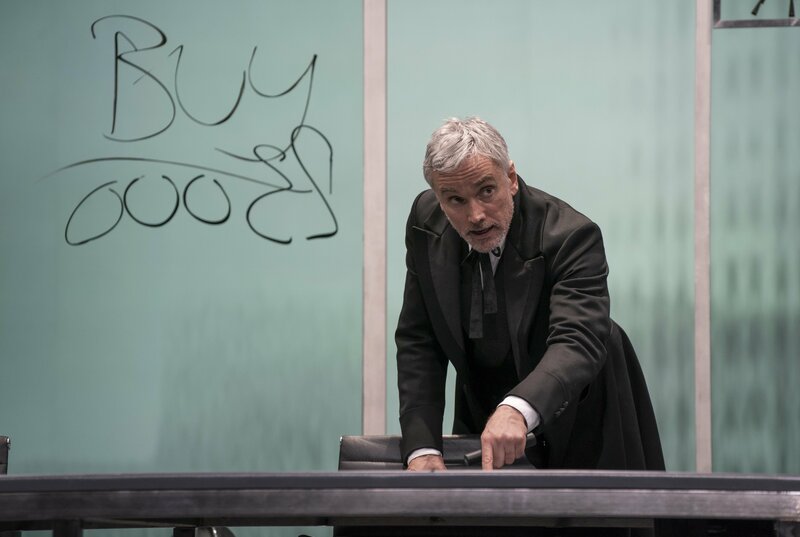 Equally successful is Mendes’ setting of the entire play within Es Devlin’s single, modern glass office set, with the boxes presumably holding the final paperwork of the collapsed Lehman Brothers Inc as props and additional furniture. Nick Powell’s immersive score, part onstage intimate piano recital, part atmospheric soundscape, plays an integral part in the drama’s seamless progress. Floating on a glassy sea with a panoramic surround, Jon Clark’s “stereophonic” lighting design incorporates Luke Halls’ majestic projections of cotton fields, harbour-scapes, and especially the growing urban jungle that is New York, giving a palpable sense of the vast potential and ever-present threat of an unstoppable expanding America. Rapidly moving imagery lends enormous power to the dreams that haunt each of the Lehmans in turn, with a brain-popping sequence towards the end as Bobbie Lehman dances his way to immortality backed by a dazzling array of increasingly meaningless numbers. 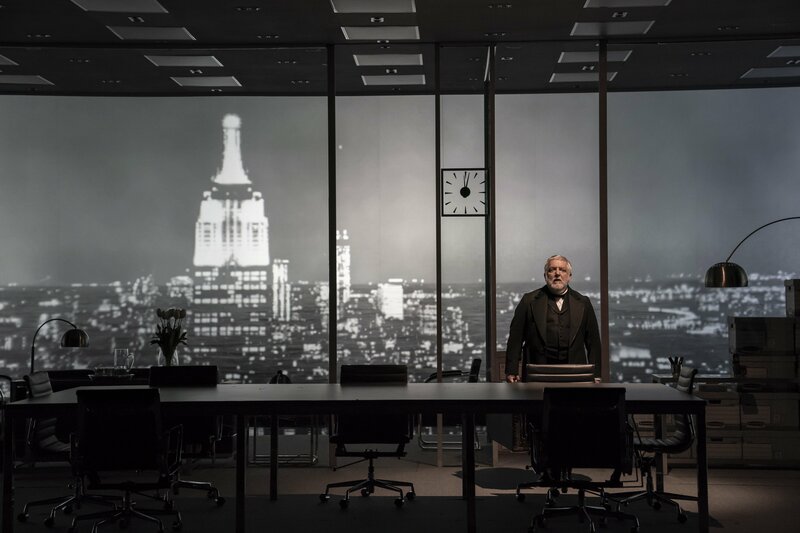 As story-telling, The Lehman Trilogy is hard to beat, whether you enjoy a family saga, an allegorical morality tale, or simply want to be entertained by the “the magical music box called America”. It is also that rare beast, a play will stay with you for days afterwards, rattling around inside the brain and yielding layer upon layer of deeper meaning. The Park Avenue Armory, New York’s most consistently ambitious arts space, has another must see on its hands. Simon Stone's bravura North American debut and Billie Piper's excoriatingly honest performance make Yerma unmissable. Simon Russell Beale is widely regarded as the finest stage actor of his generation. Ahead of The Death of Stalin, Steve Dow sat down with Beale to discuss his role as sinister NKVD chief Lavrentiy Beria. Who’d have thought that Uncle Joe could be quite this funny? Simon Russell Beale’s Prospero really is such stuff as dreams are made on.